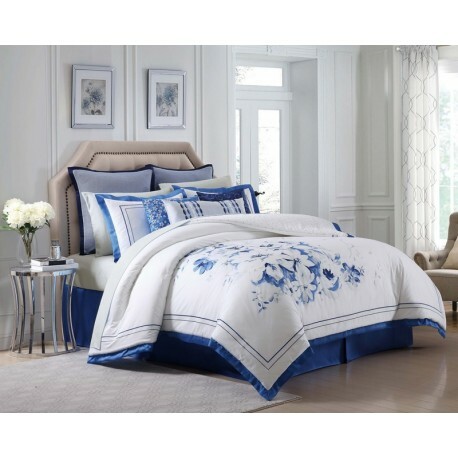 100% Cotton print on a striking white background is a clean pallet for the soft blue blooms placed on the bedding face. Relaxed yet thoroughly sophisticated, this over scaled, painterly floral in tones of porcelain, cool gray and indigo, make up this most unique, asymmetrical layout. Subtle gray leaves and scroll designs accentuate the floral elements on a crisp, white ground; the design is bordered in indigo for added contrast. The reverse of the duvet displays a signature swiss dot design in indigo on white. Textures are infused into the collection in the way of bordered embroideries and woven euro shams. The pattern features accessories that can be purchased separately with embroidered motifs on the decorative pillows to add drama and round out the ensemble. Many items in the collection feature exquisite 100% cotton cloth with embroidered highlights.